Hello. This is Kent Holland, with Construction Risk LLC. Today we’re going to do another module in, “The Contract Guide for Design Professionals.” It’s my pleasure to be with you today. Thank you for tuning in. 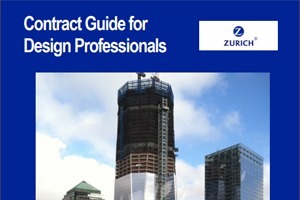 An example of a problematic clause would be something like the following: Design professional shall make visits to the site to inspect the progress and quality of the executed work of the contractor and sub-contractors, and to determine if such work is proceeding in accordance with the contract documents. The design professional shall keep the owner informed of the progress and quality of the work and shall exercise the utmost care and diligence in discovering and promptly reporting to the owner any defects or deficiencies. That clause had a number of problems. Let’s just walk through some of the issues that we see. First, we should be limiting the design professional’s role to site observation or to site monitoring reporting what was actually observed and what the design firm has actual knowledge of. The AIA has good language and the B101-2007 document at article 3.6.2.1. It’s a little bit long but I’m going to read through this with you. I’m going to put it up on a slide right now because it’s so important. I really appreciate this language. It is language that we should try to use because what it does is it effectively makes a very objective standard of whether or not the design firm completed its responsibility for site observation within the standard of care. There’s no guarantee made that you’re going to observe everything and find all the problems with the contractor’s work because indeed, you can’t. On a typical project, the design firm is only out there for an occasional site visit. Maybe once a week, maybe a couple of times a week, maybe not even that often. Obviously not there enough to see every issue of the construction and to know whether the contractor met every detail of the plans and specifications or whether something inadvertently got covered or buried before the design firm saw. What the AIA has done is effectively said, “The duty is not to go out and inspect and find all of the problems. The duty is to, if it becomes known to the design firm that there’s a problem, then it gets reported to the owner.” So it becomes an actual knowledge standard. Now with regard to inspection, sometimes it really is inspection services that are being performed by the design professional and that’s a different story. If the term inspection is used it should be well defined in the contract. Define it narrow. Let’s turn now to the clause of limitation of liability. Limitation of liability is a terrific tool to help manage the risks undertaken by a design professional particularly on a project where the fee is quite small in comparison to the risk being undertaken. For an example, a design firm that does a property condition report for typically $2,500 turns around and gets sued by a project owner for $3 million. Or the firm that does an environmental site assessment, again for $2,500. It’s not uncommon that you have multi-million dollar suits against those design firms. You can’t justify putting your neck out for that kind of risk and liability when you’re being paid such a small fee. Courts understand that. We’ll talk about each of these issues. First, I’m going to put up a sample from the EJCDC contract, where the EJCDC has no LOL clause. I’m not going to read this whole thing, it’s very long. But I just want to put it up on the screen for you to take a quick look at this. Now I’m going to put up a good example of an Limitation of Liability clause. This is one that I’ve devised over time, and have had success getting it into contracts. I think it covers a lot of important issues. Let’s just read through this together. That Limitation of Liability clause covers a lot of territory. First, you notice that it has a language to the fullest extent permitted by law. The reason we use that language is that if a court were to deem that this language of this LOL clause was somehow unenforceable, perhaps the court thinks it violated the anti-indemnity statute of a state. That happened in Georgia a few years ago. This type of a clause will allow the court to say, we will revise the clause downward to make it enforceable to the extent that the law would allow. We’ll honor the intent of the parties but we won’t throw out the entire contract clause. We’ll refine it, if you will, to pull it down to what the state law would allow. It’s important to use that language to the fullest extent permitted by law. The liability is both on this project and in the aggregate. In other words, they can’t come at you on one claim and then hit you on four more related claims and say, “Well, I get $50,000 on each one of these related claims.” No, your aggregate amount of liability was $50,000 for that client. That’s an important provision. Notice that it says that it applies to all these different causes of action whether it’s negligence, professional errors and omissions, strict liability, breach of contract or breach of warranty. I probably should put in there any kind of a tort action, because torts could be beyond negligence. It might be negligent misinterpretation, fraud, and things of that nature. This Limitation of Liability needs to be as expansive as possible because the court will only apply the clause to the very specific causes of action that you identified in the clauses. So there are cases where the clause said that the limitation of liability will be limited for breach of contract. The court has applied it to breach of contract but then said, “you didn’t apply it to negligence in the contract, therefore the negligence count can still go beyond the $50,000.” Or, ironically, it’s been written in the contract to say it applies to only the negligence actions and it doesn’t mention the breach of contract. So the court said, well it applied to negligence but not the breach of contract. So be careful to really specify every clause of action. The other thing that I like is to say that it’s going to be a fee or some other amount whichever is greater. I’ve had occasion where my fee, literally, was $2,500 for my client. When we went in to enforce the LOL provision by way of a summary judgment motion, the court was very impressed with the fact that we didn’t limit the liability to the $2,500 fee but that we gave $25,000, which was the greater of the fee. And the court said to the plaintiff’s attorney, essentially, “Sir, you’re telling me that you want me to revise this contract when it’s said right here, just as this one does at the end, that you could have negotiated for a higher amount? You’re trying to make this design firm be your insurance company without paying them for it.” They agreed to a $25,000 limitation of liability, which is 10 times greater than their fee. The court was very impressed and granted us partial summary judgment on that basis. What you do between engineers and architects and those sub-contract relations should be your business. I see no excuse for this clause requiring to go and get owner’s approval. The consensus docs 240 also provides that the owner shall be considered the intended beneficiary of the performance of the design professional’s services. That could support a direct claim by the owner against the design professional. I would strike that out, where it’s saying that they’re going to be a direct beneficiary of the performance of the services. It gives them rights to go against the sub-consultant, possibly, that they otherwise would not have. Those clauses are a good way to mutually waive these consequential damages. Those types of waivers are upheld and I reported on a recent court decision out of Maryland, out of the federal court there applying the waiver of consequential damages clause of a contract in a design professional contract between the design firm and a contractor and the court said that because the contractor had agreed to that waiver it was not entitled to recover any of the economic type damages caused by the design firm’s errors, if you will. I won’t go into that more today, but again, if you were to go to my website and just put in the topic, consequential damages or waiver of consequential damages, that court decision will pop up and my whole analysis of that decision. Another thing we can do with a waiver of consequential damages clause is try to add a few terms into that clause to make it clear what consequential damages include because the term itself is not a well defined, clearly defined term universally. If you were to ask someone what it means to be consequential damages, you’re probably going to get, if you ask two attorneys, you’re going to get almost half a dozen different answers. I’ve gone and tried to research it in different states to find out how I can argue that what the consequential damages are. I wish there were a nice, neat definition, but it’s not always so. That clause, I think, gets us closer to being able to explain to a court that these indirect and consequential damages include these types of loss of capital, loss of product, et cetera. You could also, if dealing with a shopping center, you might say lost rents, lost profits. If you’re dealing with stadiums you might say, failure to open on time. So these are all consequential damages that can be defined. Thank you for joining me today. I hope you enjoyed this session that we did on risk management. If you would like to contact me, I am putting a slide up here at the end that has my name, phone number, email address, and website information. Don’t hesitate to call me or contact me, particularly if you would like continuing education credits. We’ll explain how that can be accomplished. Thanks. Look forward to seeing you again.